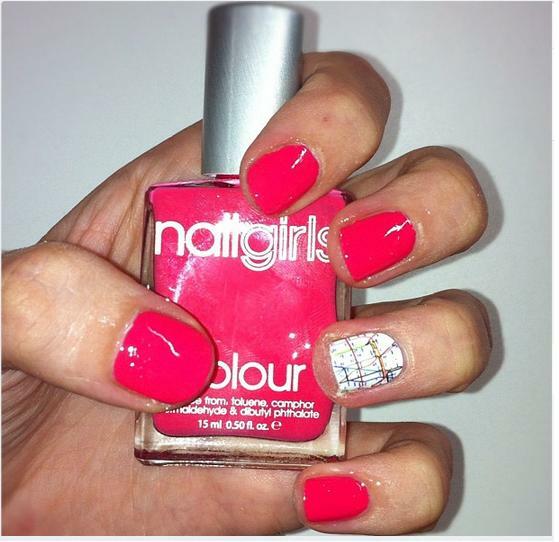 Last Thursday evening I was kindly invited down to the Jolie Box Soiree held in the Nail Girls Spa in Islington. I have featured Nail Girls polishes several times but hadn't as yet had chance to visit their lovely salon - the girls launch a new limited edition range of polishes to match the fashion catwalk collections each season. Nail Girls was created by two sisters Jo and Lynda-Louise Burrell, as a reaction to the nasty, toxic, nail wrecking polishes and spas currently saturating the beauty market. Their nail polishes are forumulated without any harmful chemicals (toluene, formaldehyde, DBP (phthalates) and Camphor). They are not tested on animals, are vegan friendly and suitable for pregnant women and best of all their packaging is recyclable. As part of the soiree event we were invited to get a file and polish and also check out their new nail wraps! I selected the Coral Pink shade from their Limited Edition S/S12 collection and decided to place a very cool London Underground Tube Map Nail Wrap on my ring fingers. What do you think?